My friend, draw near and read my words with a hearing heart. Now as never before, it is time to be determined to live in victory and not defeat. Many of us have taken life as it comes and accepted whatever it dishes out. This is not the way God intends for us to live. He has given us everything we need to live a victorious life in Him and it is found in His Word (the Bible). However, just having a Bible will not guarantee us victory. He tells us that He has “given unto us all things that pertain unto life and godliness…” and this is found in His Word. Whatever we may be facing, or whatever is going on, we must turn to the Word first as our source; rather than looking to people or the world’s system. God spoke to bring everything into existence. Likewise, He has given us His Word to use for the building of our lives. When the angel told Mary she was with child, Mary did not allow the potential for embarrassment or even persecution to stop her from receiving the Blessing of God into her life. Rather, she willingly received it, (the Word). Our lives would be drastically different if we stop looking to the world for answers and look to God and His Word! He should be the source of our lives. The scripture declares: “he gives us the power to live, to move, and to be who we are…”—Acts 17:28 (CEB). ‹ Sunday Worship: Our God is Worthy to be Praised! Amen! 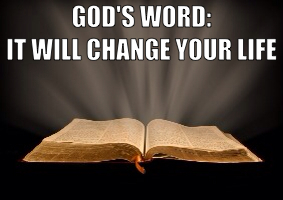 There truly is power on the word of God! Hi Deborah! Yes it is! Thank you for your response to this post! Blessings! Amen Dave and thank you! Blessings! So True Sebastian, Jesus is indeed God’s Living Word, our Light in the darkness, our Teacher our guide, who leads us into all understanding confirming His Truth by the inspired written word. How very blessed we are in this generation as we watch for His return, we see the signs, we hear the call, thank you Sebastian for reminding us we can’t go it alone, we do not rely on man, we do not rely on what we think or feel, we Trust and obey for there is no other way to be happy in Jesus but to Trust and obey. John 15:14-15 Ye are my friends, if ye do whatsoever I command you. Henceforth I call you not servants; for the servant knoweth not what his lord doeth: but I have called you friends; for all things that I have heard of my Father I have made known unto you. I will instruct you and teach you in the way you shall go. I will guide you with Mine eye. Indeed, the Word of God is alive and powerful (Heb. 4:12). Amen to this! We don’t need to look to God for a ticket to heaven but then turn to the world for every natural problem that ails us. God cares about everything in our life and has provided a solution for our every need. It’s all in His Word. Thank you Jesus! Hi Brother Dave! Thank you for reading and responding to this post…I’m happy it spoke to you! Blessings to you and yours! Hello and you’re welcome Lauralee! Thank you for reading and responding to this post! Keep checking in with us. Blessings! This is truly “Faith1st,” and that is what we need to overcome the challenges we have in life! Thank you, I’m really in agreement with the Word.